Often in this blog I write about what many would call the incidentals of buildings – odd bits of ornament, signage, details, and so on – and about buildings that are so low in status that they are little regarded by most passers-by. 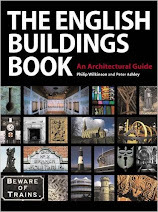 A lot of what I notice is hardly architecture at all – which is one reason why this blog is called English Buildings and not English Architecture. But I'm ending the year with a no-nonsense bit of high-status architecture, a beautifully proportioned and recently restored Georgian house, in fact one of the best provincial Georgian houses you could come across. It's St Helen's House in the centre of Derby and it was built in 1766 by local architect Joseph Pickford for one John Gisborne. In 1801 William Strutt (son of Jedediah Strutt the industrialist, textile manufacturer, and associate of Richard Arkwright who was one of the key figures in the industrial revolution) bought the house and after several generations of Strutts had lived there, the building was used as a school. The recent restoration involved a conversion to office use. The entrance front is an impressive piece of Classical design, with a triangular pediment and columns giving weight to the central portion and interest to the whole facade. There is also a satisfying balance between the ground floor, its windows set in semicircular arches, and the floor above, which has windows with more elaborate surrounds (the central ones having small pediments of their own), to emphasize the importance of the rooms they light. What one might call framing devices – the pilasters at either end and the cornice at the top of the facade – give the design further coherence, as do details such as the rustication, used in restrained fashion on the ground floor. The skyline is set off by a quintet of carved bulbous urns. This show front is, of course, faced in stone. The sides are of much plainer brick, as one can see, just, in the picture. But it's a restrained kind of showiness, and the house would have been at home in its original setting (80 acres of grounds, apparently), as it is in its urban surroundings now the city has spread around it. 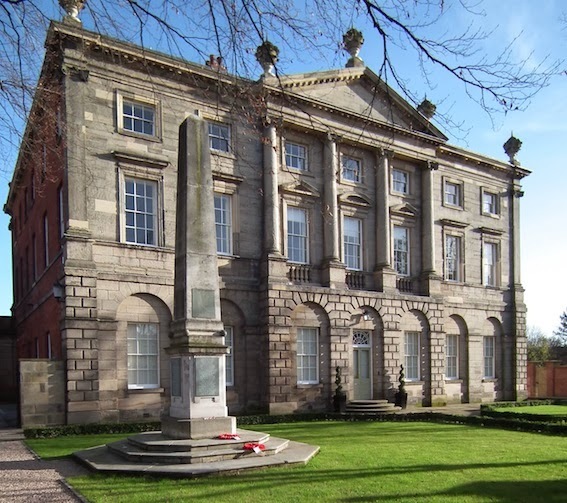 Derby can be proud, and pleased, that the building has found a new use, and its restoration has made St Helen's House a worthy winner of a Georgian Group award for a reused building. It deserves its recognition. 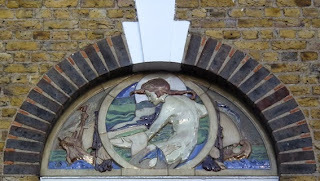 Here, as hinted in the previous post, are a few examples of the decorative Doulton panels from the blocks of flats in the Sidney Street estate in Somers Town, north of St Pancras. The ceramic panels, made in about 1937 by the artist Gilbert Bayes, seem to depict scenes from fairy tales. There's a very obvious Little Mermaid rescuing her prince (above), a young woman with swans (is it The Swan Princess, or some other tale featuring swans?) and another young woman, this time with an elaborate headdress, about to kiss a young man, this time with pigs on either side (The Princess and the Swineherd, presumably). The stylised medieval dress, flat colours, and faces in profile give quite a 1930s feel to the panels, and the decorations are in keeping with the spacious courtyard and careful architectural details, all of which help to raise these blocks above the norm for social housing. It feels right, somehow, that these buildings should have decoration that's diverting and engaging and that adds a splash of colour to an area that would have been grey, sooty, and smoky in the 1930s when the flats were built. Part of the Somers Town area to the north of St Pancras Station, the Sidney Street estate was built in the 1930s by the St Pancras House Improvement Society, which was founded by Father Basil Jellicoe and Irene Barclay, the first British woman to qualify as a quantity surveyor. The flats of the estate were part of a campaign of slum clearance in this part of London in the first part of the 20th century and these grand blocks enclosing a spacious courtyard must have been a big improvement on what was here before. 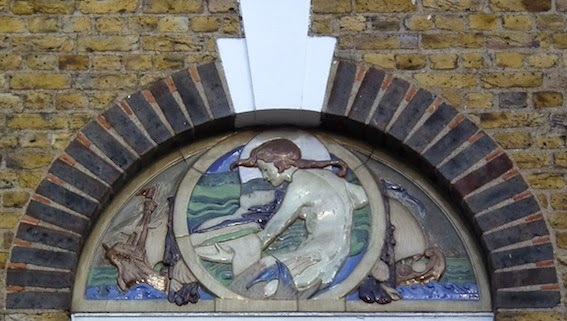 Visually the most remarkable thing about the blocks of flats on the estate is their decorative Doultonware panels, created by Doulton artist Gilbert Bayes. I hope to return to these panels, but meanwhile here is a taster, the Doultonware Christmas tree, which stands in the small side courtyard that was set aside for the washing lines. It reminds residents and passers-by, all the year round, of the sentiments of the Christmas season. Peace on Earth indeed, and Goodwill to Men. 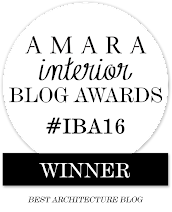 And to women and, particularly, to readers of this blog. On December 4, 1976, as the nights drew in after that memorable summer, E, a much-loved mentor, came to visit me in the room I was occupying in my last undergraduate year at university. She wanted to make sure I was settled, I think, in this important final year. Once we'd drunk the ritual tea and exchanged the expected gossip, the conversation turned to music, which had been at the centre of much of E's life. 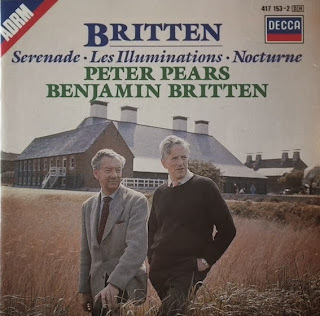 I wanted to play her a few tracks from a recording I'd just bought, of Britten's Les illuminations, and once E had got over the shock that the singer was a soprano and not the expected Peter Pears, we sat back and enjoyed the whole disc. It felt like a true connection between listeners, performers, and composer. As E pointed out, the work had been premiered by a female singer, after all, even if Pears had made the work his own in the subsequent decades. Further reflections followed. We recalled a performance of Les illuminations that we'd both attended in which the singer's pronunciation of Rimbaud's French text undermined the final bars – his parting 'Assez eu' sounded impure and guttural, more like 'assez eugh'. If we laughed about that, over our second cup of tea, I was also told that Britten was very ill now and it was likely that the stream of music that had been steadily flowing for so long would be stayed. Then E went home, and I turned back to whatever it was I was supposed to be reading. And we would no doubt have forgotten our quiet listening to Britten's song cycle had it not been for the fact that a few days later we opened our respective newspapers and learned that Britten had died that very day. A coincidence of course, but coincidences are patterns, and they stick in the memory, and haunt us, rather like the patterns of music. The patterns mean that I remember that afternoon, that I have a clearer image in my mind than I would otherwise have of the rather dingy North Oxford room I was living in then, and that I recall a shared experience with someone who meant lot to me. As far as the steady flow of music went, we learned that the tide was not quite out. The composer's third string quartet was premiered at Aldeburgh about two weeks after Britten's death. Its distinctive musical textures – often described as 'spare' because frequently only one or two instruments are playing at once – may in part be due to the composer's partly paralysed right hand. But however they got there, the sounds he produces are a distillation of his late style, deeply absorbing, and a profound example of creativity triumphant in the face of illness and death. The long last movement, entitled 'La serenissima', has been seen as death-defying. Taking a cue from its title I also see in its glittering sounds a reflection of Turner's late Venetian paintings, as if the composer, his inspiration illuminated one final time, is looking towards the light. 'Assez vu….assez eu….assez connu….' Estonian soprano Aile Asszonyi in 'Départ', the final movement of Britten's Les illuminations. In 1853, when in France Baron Haussmann was becoming Prefect of the Seine and beginning to plan his transformation of Paris, countless smaller transformation were underway in towns and cities all over the place, not a few of them to do with providing more spacious and up to date premises for businesses and offices. This bank in Aylesbury is a case in point. Long established as the Bucks & Oxon Union Bank it got a smart classical building in 1853 with rusticated ground floor with arches window recesses and bigger, pediment-topped windows upstairs. And that's all very impressive, but what made me pause was the way the architect treated the corner, especially as I've been thinking about corners after posting the unusual house in Bishop's Stortford the other day. Whereas the Bishop's Stortford building turns the corner with a tight curve of brickwork, this bank takes the junction at an angle, and with extraordinary banded rustication – masonry laid with exaggerated horizontal joints – all the way up the wall to the cornice. Those upper bands of stone seem to break the conventions that the rest of the building adheres to, not least of which is that you rusticate the lower floor and leave the upper levels plain. There are plenty of examples of rustication on upper floors – especially running up pilasters or filling the space above a central portico. But this narrow strip above the doorway does seem rather in your face, perhaps because there's nothing on the wall except the banded masonry – no windows, no columns or pilasters, just these lines of stone, ruled out like a ledger, on which various inscriptions have been cut: a sort of vertical timeline that mercifully leaves rather little space for the sign of the current proprietors. A corner that is ruled off, as it were. Sometimes the way a building turns a corner can be the best thing about it. I remember in a past post describing a particularly noticeable corner tower on a building in London – a 1930s version of many such markings of the junction between one street and another. This house in Bishop's Stortford is almost the opposite, small where the other building was grand and statement-making. Presumably there was a triangular site, where two roads, Basbow Lane and King Street, met at an acute angle. 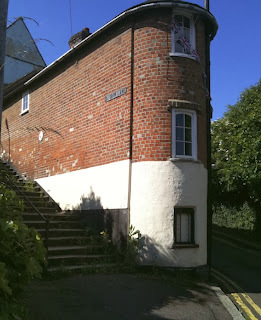 The builder (probably in the early-19th century) made full use of the plot, creating a triangular building with this beautiful curve at the junction. The bricklayer obliged with some careful brickwork. Even if the house is only about six feet wide at the apex, it does the two things it should – makes full use of the available land and turns the corner gracefully. Steps, bricks, and trees make an interesting bit of urban scenery too, rendering a small building dramatic and turning a change of level into an architectural surprise. Modest? Yes. Unregarded? Probably. But sometimes, in townscape as in life, it's the small things that matter. After Smithfield Market was redeveloped in the Victorian period, Charterhouse Street, which runs to the north of the market, partly on the path of an earlier thoroughfare called Charterhouse Lane, was redeveloped too. Since then it has seen many changes, but this building of the 1870s is a survivor of the Victorian period, originally a warehouse, now, on the ground floor at least, a restaurant. The mixture of polychrome brick and stone suggests a Venetian influence, and the building is in a kind of Venetian-Renaissance style, with round arches, classical mouldings, and carved decoration. Pevsner describes this facade as 'naive but vigorous'. 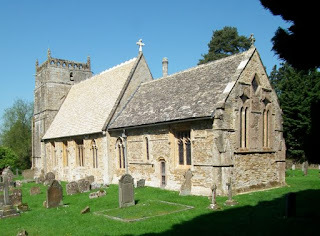 There's certainly a lot going on – roundels with carved stone heads leaning out of them; more roundels, with foliage, at the top of the window arches; foliate capitals atop the slender stone shafts; a row of stone 'nailheads' beneath the moulded cornice; a repeat of the nailheads further down. And that's before we get to the polychrome brick, which is quite restrained, but brings each window arch to a slight point at the very top, beneath the cornice, adding a Gothic element to the mix. John Ruskin's The Stones of Venice had been published for over 20 years when this facade was built. Its builder had certainly drunk at the Ruskinian spring, even though Venice's great appreciator would probably have preferred a more refined version of the city's style than the one on display here. But a bit of polychrome brightness has its place in the commercial heart of the capital. Naive? Maybe. Decorative? Certainly. Uplifting? Absolutely. An asset, I'd say, to this absorbing and varied bit of London's townscape. 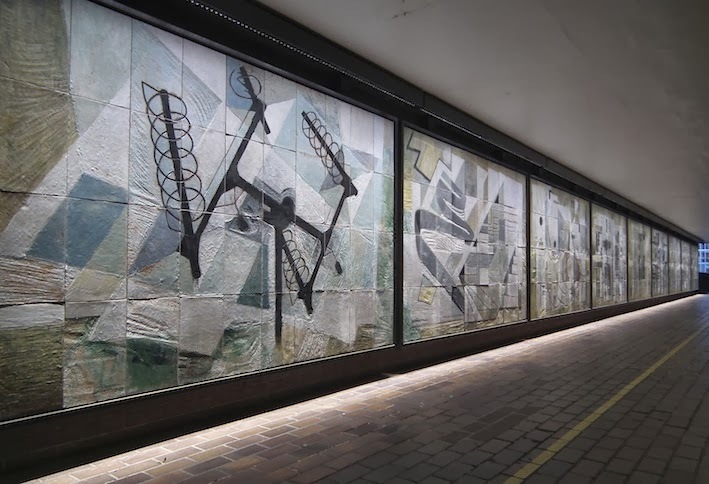 The other week I walked up London's Farringdon Street, hoping to find and photograph a series of tile murals made by Dorothy Annan for the Central Telegraph Office, a building housing a large telephone exchange that was built in about 1960. When I got there I found nine boarded-up spaces along the ground floor of the building: the murals had gone and the building, empty, dusty, and forlorn, looked ripe for demolition. I soon discovered that the tile panels, thanks no doubt to the recent campaigning on behalf of such architectural art by the Twentieth Century Society, had been saved. They have been installed on one of the High Walks in the Barbican complex and I quickly found them, not far from the Guildhall School of Music and Drama, which was emitting seductive high-pitched flute and violin sounds as I settled down to have a good look. Annan's tile panels have names like Cross Connection Frame and Lines Over the Countryside. They make evocative compositions out of arrangements of aerials, cable buoys, switches, wires, and bits of circuit diagrams, all of which Annan researched carefully before turning them into semi-abstract compositions which – as the accompanying caption remarks – are part Ben Nicholson, part Joan Miró. Looking at the panels (the two most clearly visible in the photograph at the top of this post are Radio Communication and Television and Cables and Communications in Buildings) it would be easy to make remarks about the optimism of the 1960s and the then Prime Minister Harold Wilson's famous enthusiasm for 'the white heat of technology'. But in the restrained palette and artful rhythms of these panels (the Ben Nicholson aspect of them, as it were), there is something less insistent, less frenetic. Their lovely handmade textures are beautifully crafted, too. There is tension in the spiralling wires and chunky aerials in these panels, it's true. But there is also landscape in them, hints in the colour and texture of the tiles of grass and sea and sky; cables that flow like rivers or rise and dip like hills and valleys. I think they're turned on to nature as well as to technology. And for that reason they seem to me to sit rather well in the Barbican, where water and planting complement the chunky hammered concrete, where your feet are always on tiles, and where intriguing sonic signals emerge from student musicians in their practice rooms to captivate the ear. Thanks to one of my readers for pointing out that the blog Spitalfields Life has also covered these panels. I was pleased to see that the Gentle Author, proprietor of the Spitalfields Life blog, also appreciates the combination of technology and organic forms that's evident in these works. The Gentle Author illustrates all the panels here. 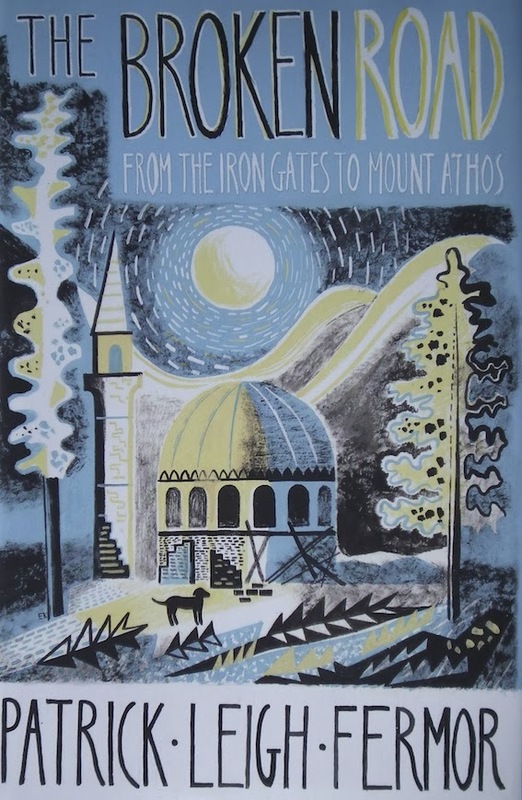 In the 1970s and 1980s, Patrick Leigh Fermor published A Time of Gifts and Between the Woods and the Water, the first two volumes of a projected trilogy, describing the walk he made in 1934 from the Hook of Holland to the city of Istanbul (or, as he insisted on calling it, Constantinople). Between the Woods and the Water took the young Paddy Leigh Fermor to the Iron Gates (on the Danube at the frontier of Romania and what is now Serbia). And there everything stopped. The promised third volume never appeared, and in 2011 Paddy died. The Broken Road is the nearest we will get to the missing last volume. Its editors, Artemis Cooper and Colin Thubron, explain in their introduction that Paddy had actually begun this third volume before he started the two that were published. In 1962, as the result of a commission from an American magazine to write about 'The Pleasures of Walking' he began to write up his great walk. Around about the Iron Gates, he realised that he was compressing his memories uncomfortably, so began to be more expansive, producing an extended, book-length account of most of the last third of his walk. He eventually had, therefore, a short account of the first two-thirds, a longer, more reflective and allusive record of the Bulgarian portion – and nothing that would do as an article for his American magazine. In the mid-1960s he put the project to one side, and when he returned to it in the 1970s, he realised that he had to start over, writing a new account of the first portion, the account that became A Time of Gifts and Between the Woods and the Water. Then nothing. Paddy, it seems, despaired of turning part three into anything as good as the first two books (which had, of course, received adulation from reviewers and readers alike). He just couldn't see how he could do it – and things were made worse with the death of his two greatest supporters, his publisher Jock Murray and his wife, Joan. Even in his last years, though, fighting tunnel vision, Paddy returned to the old manuscript, working in pen on a large-size print out. Artemis Cooper and Colin Thubron have prepared this version for publication as The Broken Road – it's their title (though nearly all the words in the book itself are Paddy's) and it acknowledges that the manuscript was never finished: it breaks off by the Black Sea, a few days' walk from Constantinople. A very brief diary Paddy wrote in the city on the Bosphorus, together with a more extended diary covering his subsequent trip to Mount Athos, complete the book. Although the author would no doubt have changed much more if he could, and rewritten whole chunks, the book is still a marvel. 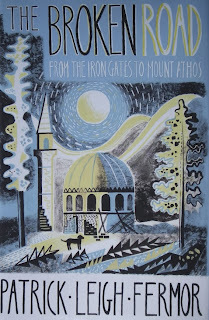 It's full of the evocative descriptions of places – from the Bulgarian town of Tirnovo, its 'sharp flight of houses hovering in ascending waves along the lip of a precipice', to Messembria with its ancient churches 'embedded by heaps of rubble and choked with weeds and brambles'. People too: itinerant bee-keepers, cobblers, a wheelwright, a man unsuccessfully shooting at wildfowl from a small boat. And animals and flocks of birds: cormorants with necks like submarine periscopes, an airborne horde of storks portrayed in a great set-piece. Other perennial Paddy preoccupations – language, costumes and hats, architecture, the tectonic movements of Central European history – are all here. There's also a certain amount of comment about the perilous process of writing about things that happened decades before. He says quite a lot about piecing together the memories, about the unreliability of the marks he made on his map (surely he stayed in more places than he marked), about the places he had revisited in the interim, so that memories are overlaid and difficult to disentangle. Paddy is also honest about his periods of depression – something little touched on (as far as I can recall) in the first two books. 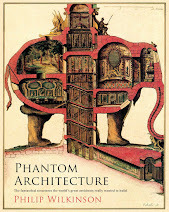 This makes his hesitations, prevarications, and delays in producing book three all the more easy to understand – but also helps us to understand the corollary of all this – Paddy's relentless enthusiasm for so much of what he saw, his wonder, his delight, and his determination to capture this in his jewelled, sometimes Baroque, prose. One is only sometimes warned, when these processes begin, of their crucial importance: that certain poems, paintings, kinds of music, books, or ideas are going to change everything, or that one is going to fall in love or become friends for life; the many lengthening strands, in fact, which, plaited together, compose a lifetime. One should be able to detect the muffled bang of the starter's gun. This journey was punctuated with these inaudible reports: daysprings veiled and epiphanies in plain clothes. The book may be unfinished, but these cultural encounters – with books, buildings, places, and people too – pull us up short time after time, giving form and meaning to the author's life, and bringing illumination to our own. My post about Patrick Leigh Fermor's gravestone is here. My review of Artemis Cooper's biography of Paddy is here. Richard Mabey is our best natural history writer and will need no introduction to most of my readers in Britain. He has been enlightening us about woods and weeds, flowers and nightingales since he burst into the consciousness of British readers in 1972 with Food For Free, which taught us to forage – and, just as importantly, taught us the alert, inquisitive attitude that is the prerequisite of both the forager and the naturalist. 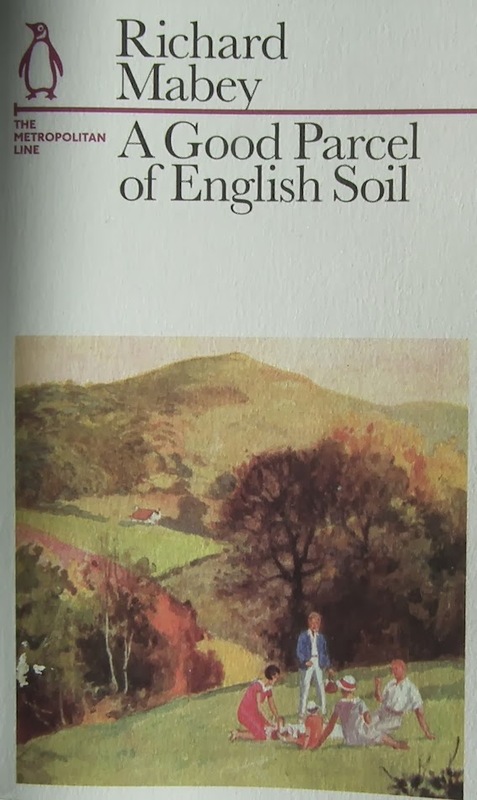 A Good Parcel of English Soil is a short book in a series Penguin commissioned, each of which is by a different author, each based in some way on one of the lines of the London Underground system. Mabey's line is the Metropolitan, the line that snakes its way out of the capital, starting near the centre at Faringdon and heading west and north, through the circling suburbs and out into the countryside towards distant Buckinghamshire places like Chalfont and Amersham. Its heartland is made up of those suburbs that the railway company cannily built to provide passengers for its trains, with their streets of Tudoresque semi-detached houses spreading through places from Wembley Park to Chesham. It's the place they called Metroland. Mabey summarizes the story of Metroland's opportunistic development, and conjures up the neighbourly and oddball combination that characterizes the area. 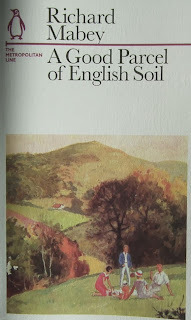 But the more interesting part of his book is what follows this summary, the author's account of his own explorations in the hinterland of the line – from his experiences around his childhood (and adult) home in Berkhamsted, where he learned to observe and to forage, to his explorations of line-side territory closer to London when he worked as an editor helping Penguin reinvent the school textbook in the 1960s. These explorations cover a lot of ground. There are ancient woodlands and narrow lanes and bits of the Chiltern hills. But, perhaps more tellingly, there is the experience of finding nature where most people do not bother to look. There are martins nesting in an artificial sandbank, burgeoning Asian and Mediterranean shrubs colonizing derelict Victorian rubbish tips, grebes nesting in floating car tyres, swallows looping beneath gigantic sewage pipes, the remains of wartime vegetable gardens running beside the railway, red-crested pochard ('the oddest, most plastic-looking wild duck I had ever seen') at home on a man-made lake. What emerges from these observations is a sense that Metroland is a borderland between neat development and the countryside and the idea that the disintegration that occurs near development – the yards, vacant lots, rubbish tips, gravel pits, and so on – are sources of wonder and growth. This is the subject of another of Mabey's books, the marvellous The Unofficial Countryside, but it is a subject that is rich enough to warrant further exploration – further exploration is the whole point, after all – in the light of the closeness of country and city that Metroland embodies. This closeness is wonderfully symbolized at the end of the book by the Red Kite, the bird that, reintroduced to the Chilterns, is now confirming its ability to be at home in urban and rural habitats alike. It's an inspiring source of optimism, this majestic bird, and in that, too, it is like the work of the master naturalist surveying the mix of town, country, and unpromising edgeland that he has described as his home patch.